Cape Town - Johann Louw bagged a 10-wicket haul as the Cape Cobras crushed the Warriors by an innings and 50 runs in their top-of-the-table Sunfoil Series clash at Buffalo Park in East London on Friday. Justin Ontong hit an unbeaten 90 for the Cape Cobras on day two as the match continued to progress at a rapid rate with the visitors resuming the second day on 165/6, 58 runs ahead of the Warriors' dismal first innings total of 107. Twenty-seven wickets had already fallen in the match by lunch on day two as the Warriors went to the break on 62/7, still 73 runs behind the visitors. The Cape Cobras had won the toss on day one and chose to field first. The Warriors fell apart as Beuran Hendricks finished the first innings with a return of 7.4-2-34-5 as the hosts were bowled out for 107. The visitors got off to an equally shaky start in their reply as their top order struggled, but Ontong stood firm and led from the front to help the visitors edge a lead of 134 runs on day two before they were all out for 241. Basheeru-Deen Walters finished with figures of 16.3-4-64-6. The Warriors' second innings couldn't have got off to a worse start. Davy Jacobs was out in the first over, caught leg-before by Louw and Charl Langeveldt sent Michael Price on his way in the second over, with the opener driving and getting an edge through to Alistair Gray in the slips to leave the hosts reeling at 0/2. 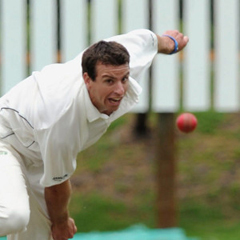 The slump continued as Louw ripped through the top order, picking up five wickets while Langeveldt bagged two. The last over before lunch saw Walters open arms and take on Louw, hitting the bowler for a four and a six consecutively before the players headed to lunch with the Warriors on 62/7, still 73 runs behind the visitors. The destruction continued after the break with Walters being the first to fall as he edged Hendricks through to the slips. Louw wrapped up the tail and the Warriors were all out for 84 as the Cape Cobras romped to victory and extended their lead at the top of the Sunfoil Series table. The Western Cape-franchise currently sits on 79.58 points and, despite the heavy defeat, the Warriors remain second on 55.62 points, but this will soon change as the two other Sunfoil Series fixtures are yet to be concluded.